Not everyone, however, shares this sentiment. According to San Jose Mercury News, "On March 3, the [Stanford] university's Faculty Senate voted to unanimously approve a motion acknowledging the ASSU's resolution to rename Serra Dorm, Serra House, Serra Street and the university's address, 450 Serra Mall. "Leftist students at Stanford assert that St. Serra "exploited" Native Americans and would like to expunge his holy name from history. They falsely accuse him of establishing missions where Spanish soldiers supposedly raped Indian women with impunity. Like nearly all liberal causes, these accusations do not stem from any genuine concern for the welfare of American Indians. Rather, they are motivated primarily by hatred for the Catholic Church and its missions, which had a dual purpose: to Christianize and to civilize. Many American Indians today hold St. Serra in veneration for his heroic actions on behalf of their ancestors. To archeologist Ruben Mendoza, who is of Mexican and Yaqui Indian descent, St. Serra was essential in the creation of modern-day California. Not surprisingly, Mr. Mendoza has come under fire from the supposedly tolerant historical revisionists who work hard to tarnish St. Serra’s reputation. 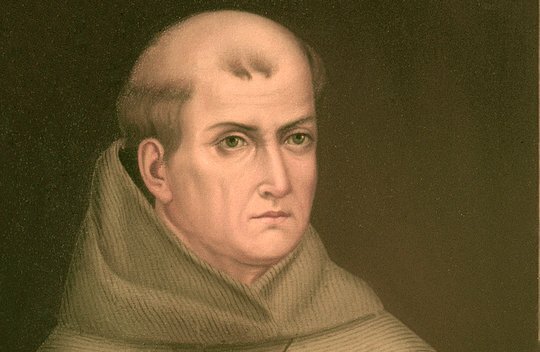 Opposition to St. Junipero Serra is not just limited to college campuses. In California, State Senator Ricardo Lara (D – Bell Gardens), an open homosexual, has been working to have St. Serra’s statue at the U.S. Capitol rotunda removed and replaced by another homosexual, former astronaut Sally Ride. Fortunately, he has been criticized by California Catholics who defend Fr. Serra’s legacy. It is important to understand that this movement goes far beyond erasing the memory of St. Serra; it is part of a larger effort to damage the reputation of the Catholic Church and Her evangelizing mission and rewrite our nation’s history in the false, secular image of political correctness. Many of the nation’s top academic institutions have jumped on the bandwagon. At the University of California - Irvine, students reported being “triggered” last year by the American flag and unsuccessfully attempted to have it removed because they considered it offensive to immigrants and minorities. The Black Student Union at the University of California - Berkeley made demands that the university rename a building on campus known as Barrow’s Hall and replace it with that of Black Panther member, convicted cop-killer, prison escapee Joanne Chesimard. The figures promoted by liberals as alternatives to Catholic heroes such as St. Serra are almost all terrorists, murderers, or adherents to radical or subversive movements. These historical revisionists are willing to use any artifice, including deceit, to eradicate the golden pages of history that document the glorious deeds of heroes such as St. Serra, who brought Christian Civilization to this part of the New World and created the conditions for it to flourish for the benefit and salvation of so many souls.